Helen has cerebral palsy, speaks with difficulty and has mobility only in one hand and foot. But this hasn’t stopped her getting a degree in astrophysics, driving a converted van and working for BBC Wales! 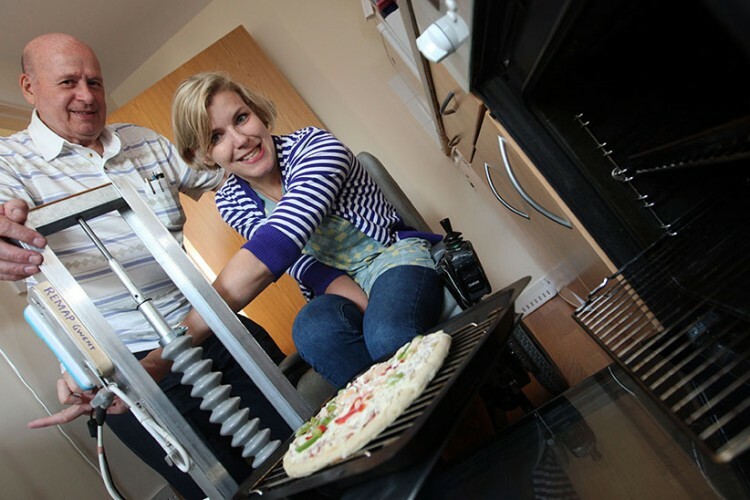 She has help with cooking and cleaning, but was determined to prepare some of her meals herself – a favourite being pizza. She asked Remap Gwent to make her something to get food into and out of the microwave and the oven. The trolley that volunteer Roger Vaughan has made for her includes a tray which moves up and down between the two ovens, and can turn through 360 degrees and extend.